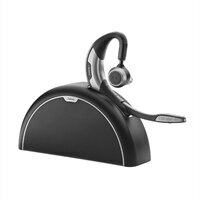 Jabra Motion UC with Travel & Charge Kit MS - over-the-ear Mount Headset - Bluetooth 4.0The Jabra MOTION UC with Travel and Charge Kit MS is the ultimate headset for unified communications with travel and charge kit that allows you to communicate easily, both in the office and on the go. When used with your UC client you get full integration, including automatic updating of your UC presence status when on a smartphone call. The headset's Busylight indicator also ensures that you avoid interruptions. Designed for maximum convenience and providing superior wearing comfort, it helps simplify your busy lifestyle. It is the only headset you'll ever need. The Jabra MOTION UC with Travel and Charge Kit MS is the ultimate headset for unified communications with travel and charge kit that allows you to communicate easily, both in the office and on the go. When used with your UC client you get full integration, including automatic updating of your UC presence status when on a smartphone call. The headset's Busylight indicator also ensures that you avoid interruptions. Designed for maximum convenience and providing superior wearing comfort, it helps simplify your busy lifestyle. It is the only headset you'll ever need.